When you create an app, or someone shares an app with you, you can run that app on Windows, iOS, Android, or in a web browser. In this topic, you'll learn how to run a canvas app on a mobile device. Apps running on a mobile device can take advantage of the device's capabilities, such as location services and camera. 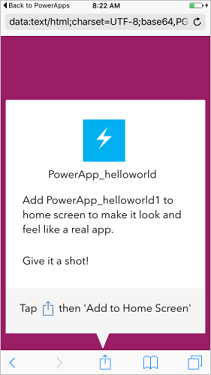 To follow this procedure, if you're not signed up for PowerApps, sign up for free before you begin, and then download PowerApps from the App Store or Google Play onto an iPhone, iPad, or Android device running a supported operating system. Also, make sure you have access to a canvas app that you created or that someone else created and shared with you. 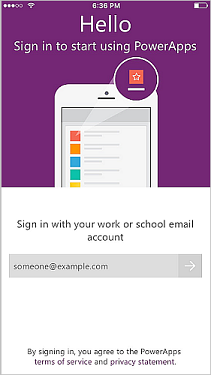 Open PowerApps on your mobile device and sign in using your Azure Active Directory credentials. If you have the Microsoft Authenticator app installed on your mobile device, simply enter your username when prompted, and then approve the notification sent to your device. 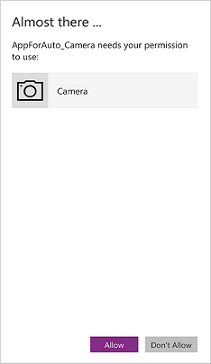 To make it easier to find the app, open the PowerApps menu, and then select a filter. All apps: Displays all apps to which you have access, including apps you created and apps that others shared with you. My Apps: Displays apps that you've run at least once. Sample apps: Displays sample apps from Microsoft that showcase real application scenarios with fictitious data to help you explore design possibilities. 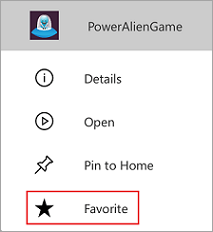 Favorites: Displays apps that you've marked by tapping the ellipsis (...) on the app tile, and then tapping Favorite. To remove an app from this list, tap the ellipsis (...) on the app tile, and then tap Unfavorite. After you filter your apps, you can sort the filtered list by the date the apps were most recently opened or modified, or alphabetically by name. These preferences are retained when you close and reopen PowerApps. 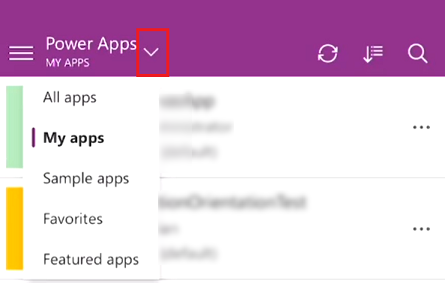 If you know the name of the app you want to run, you can tap the search icon at the top of Powerapps, and then type part of its name in the search box. If you filtered your apps, it will search the filtered list. To run a canvas app on a mobile device, tap the app tile. If someone else created a canvas app and shared it with you in an email, you can run the app by tapping the link in the email. 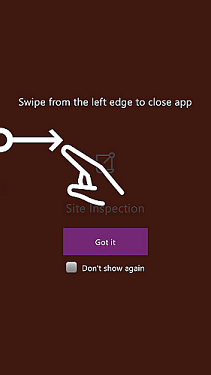 If this is the first time you're using PowerApps, a screen shows the swipe gesture to close the app. You can pin an app to the home screen of your device for quick access. Tap the ellipsis (...) on the app tile, tap Pin to Home, and then follow the instructions that appear. To close an app, use your finger to swipe from the left edge of the app to the right. On Android devices, you can also press the Back button and then confirm that you intended to close the app. In this topic, you learned how to run a canvas app on a mobile device. You can also run model-driven apps on a mobile device.